As leaders, we want to collect accurate knowledge in a way that builds and maintains positive relationships. It’s one of the ways that we cultivate our personal influence. Unfortunately, we sometimes base our actions and opinions on assumptions, rather than accurate information. Assumptions are not all bad. We walk up to a door, and we assume that the doorknob is going to turn and the door is going to open. 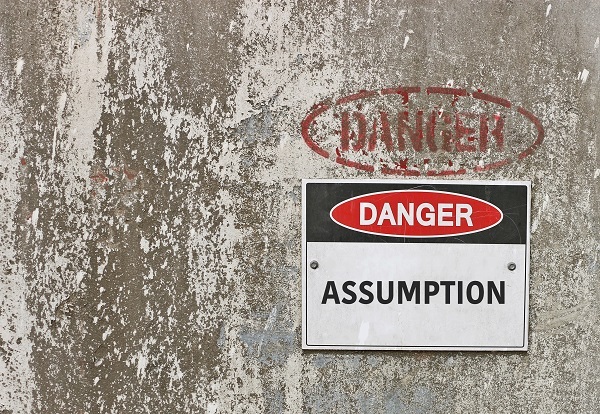 We base a lot of our lives on assumptions because they save us time and make life easier. However, it’s important to be aware of when we’re making assumptions. In conflict resolution workshops, participants role-play a scenario about laundry. Almost all of them take on the stereotypical gender role for laundry. Male or female, if they are the ones with responsibility for laundry, they take on the societal role of females. During the discussion after the role play, participants are surprised at how easily they assumed women do the laundry. No one questioned or even realized the assumptions they were making. The strength of the gender roles was surprising because the scenario was based on a Marine who did the laundry and didn’t feel he was appreciated. We don’t want to hold any assumptions, but we often do without even realizing it. 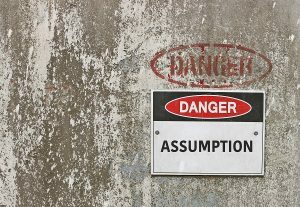 The real danger of assumptions is that we don’t realize that they are assumptions. Many times, we transform the assumptions into absolute truth in our heads. For example, somebody doesn’t say good morning to us, and we assume that the person is ignoring us on purpose. The truth may be that he or she had a really bad morning and didn’t even notice us. However, we make up this story in our head about the person being uppity and thinking that they are better than us. We move forward as if that assumption is true and treat the other person accordingly. We allow an assumption that probably isn’t true to influence our relationship in a negative way. The poor person who didn’t say good morning will probably be mystified by our chilly and maybe even unprofessional behavior. As a leader, it is important to stop and ask, “Is this something I really know, or am I making an assumption?” The only way to know if something is true or not is to ask. Perhaps a person’s poor performance is due to laziness, but it could also be caused by a lack of training, illness, or just not understanding that a particular task is a priority. As leaders, it’s our job to find out for sure, not assume.